Information is everywhere, and defines everything in today's society. Moreover, information is a key concept in a wide range of academic disciplines, from quantum physics to public policy. However, these disciplines all interpret the concept in quite different ways. This book looks at information in several different academic disciplines - cybernetics, ICT, communications theory, semiotics, information systems, library science, linguistics, quantum physics and public policy. Perspectives on Information brings clarity and coherence to different perspectives through promoting information as a unifying concept across the disciplinary spectrum. 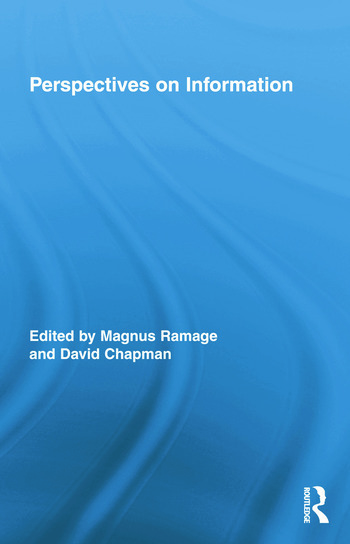 Though conceived as a contribution to the ongoing conversation between academic disciplines into the nature of information, the deliberately accessible style of this text (reflecting the authors’ backgrounds at The Open University) will be make it valuable for anyone who needs to know something more about information. Given the ubiquity of information in the 21st century, that means everyone. 1. Introduction. Magnus Ramage and David Chapman 2. Competing Models of Information in the History of Cybernetics. Magnus Ramage 3. ‘The Information Revolution’: Taking a Long View. Chris Bissell 4. Information, Meaning and Context. Magnus Ramage is a Lecturer in the Communication and Systems Department at The Open University, where he researches and teaches on the nature of information, online collaboration and the history of systems thinking. He is co-author of Systems Thinkers (2009) and Online Communication and Collaboration: A Reader (Routledge, 2010). David Chapman is a Senior Lecturer at The Open University. Previously a practicing engineer at Plessey Telecommunications, he now researches and teaches on the nature of information, ICTs, and ICTs and society. He is co-author of Digital Signal Transmission (1992) and blogs about information at intropy.co.uk.